This season’s rivalry between South Africa and England took another turn in Singapore as the English came back from a poor start to the day to defeat the Blitzboks in pool play for the fourth time in 2016-17. On a day of twists and turns in the National Stadium, England went through as one of the Cup quarter-finalists and will face Kenya, while Fiji take on USA, Australia play South Africa and New Zealand battle Canada. Three teams went unbeaten as Fiji, Australia and New Zealand took three wins from three, while Japan claimed yet another scalp on the world stage as Damian Karauna’s side beat France. Australia, who impressed last week in Hong Kong, maintained a perfect record but in the process lost key players in Ed Jenkins, James Stannard and captain Tom Lucas. Meanwhile last year’s HSBC Singapore Sevens champions Kenya remain in contention as they won twice on Saturday against Argentina and Samoa to ensure a place in the last eight. Following their impressive victory at the Hong Kong Sevens the previous week, Olympic champions Fiji continued their winning streak at the pool stages in Singapore on Saturday. First up were invitational side Hong Kong who were re-introduced to the world series with a 52-0 defeat, before the Fijians put Russia away, 38-7. Canada also teed-up a top of the table pool clash with the Fijians as they overcame Russia, 28-15, before putting Hong Kong to the sword, 34-0. While Canada took the game to Fiji in the opening minutes, and were unfortunate not to score early on, a hat-trick from Waisea Nacuqu along with scores from Sevuloni Mocenagaci and Mesulame Kunavula saw the Fijians top the pool with a 35-7 win. 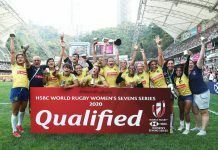 Elsewhere, Hong Kong got their first win as they beat Russia, 26-19. France hadn’t beaten England since Las Vegas in 2016, and they started their day by amending that with a 24-14 victory in Singapore. Despite Ollie Lyndsey-Hague’s opening score, two tries by Jean Pascal Barraque led France to a win against Simon Amor’s outfit, who currently sit third in the standings. The French proved that their first game was not a one-off as they brought the game to series leaders South Africa as the crowds continued to roll in to the National Stadium on a humid Saturday afternoon. 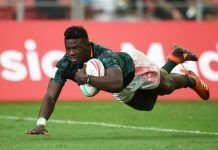 But even though South Africa were reduced to six men, two tries from Siviwe Soyizwapi cancelled out the one score from France’s Sacha Valleau, as it finished 10-7 in favour of the Blitzboks. In other Pool B play, South Africa beat Japan 52-0 and while the latter scored two tries against England, it finished 40-10 to English. Arguably the upset of the night came in the early evening as Japan took on a buoyant French side. The Japanese, who finished just outside the medals at the Olympic Games in Rio last August, have failed to ignite on the series so far this season, but it finally came together for them in Singapore as they went 7-0 up through Katsuyuki Sakai before Kameli Soejima made it 14-0, much to the delight of the crowd at the National Stadium. France struck back after the break through Jerermy Aicardi but another Japanese try in the corner from Patrick Stehlin extended the lead and a late French try was only as consolation as they celebrated a 21-14 win. Kenya returned to the National Stadium in Singapore as tournament champions and hoped to put their poor series form behind them. Things seemed to go to plan as they opened the proceedings on day one with two tries from Frank Wanyama helping them to a 22-5 win over Argentina. Samoa, who seem to be growing at each tournament under legendary coach Gordon Tietjens, took the fight to Australia in the second game of the day, but for the second time in as many weeks, the Samoans came up short as two tries from Simon Kennewell saw the Australians grind out a 19-12 win. 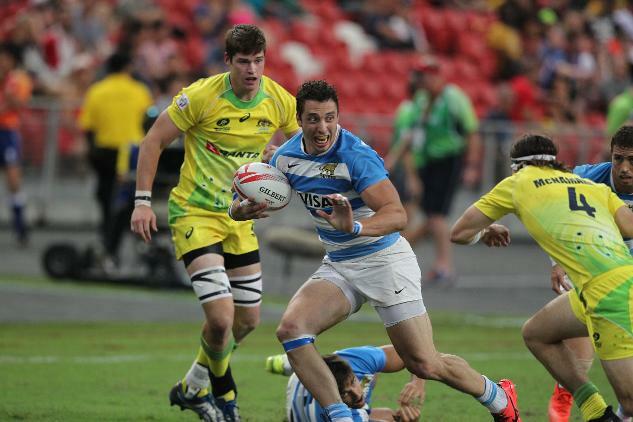 Later in Pool C, Argentina scored three tries as they beat Samoa 17-7 and Australia put Kenya away easily, 27-7. The clincher came later in the day. Both Australia and Argentina have been promising much all season and both sides were keen to win this pool decider. Charlie Taylor opened the scoring for Australia but a touch of class from Franco Sabato, who showed his football skills to catch the bounce perfectly and score, locked the match at seven points each at the break. Kennewell put his side ahead in the second half and it was super-sub Henry Hutchison who scored shortly after coming on to make sure Australia topped the pool on day one. 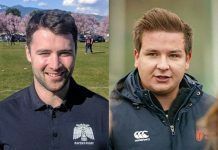 The three wins weren’t without a downside however, as skipper Tom Lucas was taken off with a knock while experienced duo James Stannard (nose) and Ed Jenkins (shoulder) won’t play any part on day two. Kenya later beat Samoa, 17-7, to ensure they stayed in contention to retain their HSBC Singapore Sevens crown. New Zealand’s Joe Webber made his return to the All Black Sevens for the first time since Sydney in 2016 when he came on against Scotland. The All Black Sevens took an early lead with tries from Regan Ware, Joe Ravouvou and Trael Joass but Scotland fought their way back in with tries from Mark Robertson, Scott Wight and Joseva Nayacavou. Scotland will rue some mistakes over the 14 minutes as the men in black took the win, 22-21. It was Webber who signed off on a top team try later in the day when he touched down for New Zealand in their win over Wales, 36-14. The World Rugby Sevens Player of the Year will be announced at the end of the year and already it’s fair to say that Perry Baker could arguably be involved. The number 11, who scored nine tries in Hong Kong last week, got his day started with two magnificent tries against Wales as the Americans walked away with a 35-19 win. He then started the second game as he finished the first, scoring another scorcher against Scotland from deep in his own half as they won again 33-26 in a close, physical encounter. Scotland finished bottom of the group after they lost to Wales, 19-21. Sam Dickson scored his 50th series try to open the scoring in the last match of the evening as New Zealand took on USA in the pool decider. The Americans lost Perry Baker early and New Zealand were denied a try before a sublime offload by Joe Ravouvou set up Regan Ware to make it 14-0 at the break. Big Danny Barrett powered over in the second half, before a converted try from Ware helped New Zealand top the pool with a 21-14 win.